How do, Tony! 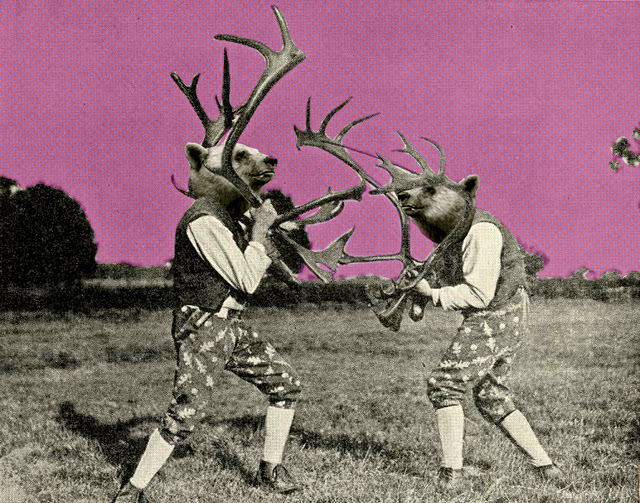 Bringing antlers to a bear fight again? The matching pants are the key element in this bear fight. Weird: I'm seeing a different screen than usual when I post comments. Wonder if there's been an upgrade, or if my computer is just wacko today. Yes I changed it this morning. Thanks for the change -- definitely seems like an improvement. I like the fact that it goes straight back to the playlist after a comment has been posted. Yeah, you never leave the playlist! David Nelson's band played in the venue around the corner from me a couple weeks ago. I think Pete Sears is in the band, too. Can you foresee the new/old LoungePunkSoulJazz movement? Did Mr. Cool say he used to fool around with Pat Nixon? Yep. And that he used to call his sister 'Sadie'. I bet Mr. Cool called all the ladies 'Sadie'. "And this is the reason for that I will leave her...." Oy yeah! where else can ya get Gentle Giant and Kiss in the same set?? TC on fire! Thanks, all! See yerz next time! !